Admittedly we put the event together in hurried fashion. Word didn't get out to the public as broadly or with enough lead time so only a couple of families showed up. Then there was the sky. We were not far away from the city of Ravenna but I'd hoped we would be just far enough away to escape the "light bubble." Not much luck there. As the Sun sank below the western horizon a funny thing happened … twilight moved to the south. Yeah, huge levels of light pollution rose up in the southern sky right through the heart of Sagittarius. So while the clear skies allowed us to see the Milky Way with dust lane directly overhead, its heart was obliterated by the "Ravenna Nebula." Too bad. Attendees and volunteers did, however, enjoy a few very good Perseid meteors. I myself saw only about five; being busy with telescopes and chatting with visitors has its costs. The telescope worked fairly well but was impeded for want of a really good polar alignment: it had problems centering on objects it was told to "GoTo" but tracked well once there. The dew point was high and everything quickly became quite damp, even wet. The AstroZap dew shield saved the telescopic view, however, so we saw decent views of Jupiter, the Andromeda Galaxy, and M15 (a globular star cluster in the constellation Pegasus). My night ended with a beautiful meteor speeding overhead, a faint trail lasting for a couple of seconds after its passage. Thank you! I tore down after the official 11:30 close and headed home. 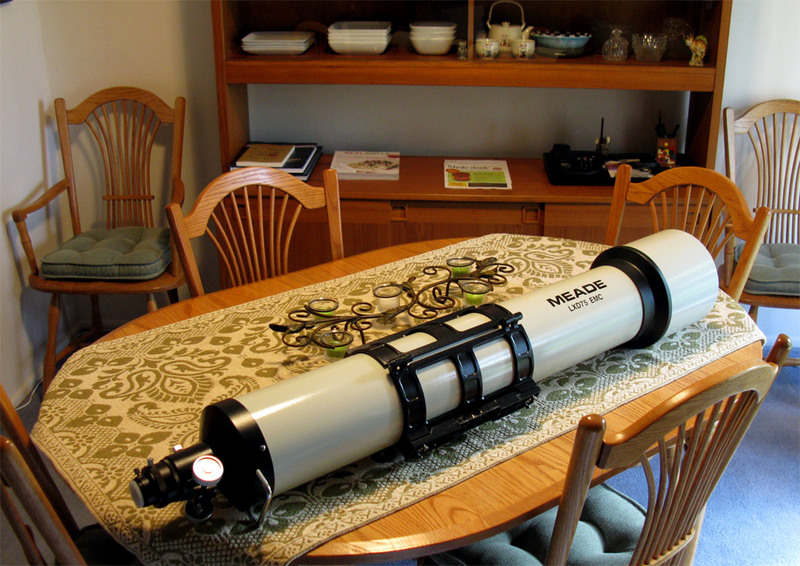 As usual I opened equipment cases and removed the telescope so that it could dry in the dining area of our house. Storing wet equipment isn't a good thing to do. Gad that's a big telescope! The morning dawned hazy and cool. The chipmunk-planted sunflowers glowed in the early-morning sunshine. And I'm glad I took the day off; perhaps I can nap later. Andy left our house at midnight and drove out to the miniature airfield on the edge of town (Co Rd 13) and got a fantastic view from there. At the end of his evening he also witnessed a large meteor which lasted about 1/4 of the way across the sky.Wish I could've seen it as well. I'm too old and lazy to do so. Husband and I did go out in the cul du sac for awhile before 11:00 but were "only" treated to beautiful views of stars, planets, and a bit of the Milky Way. Beautiful regardless of the lack of meteors. The chipmunk did a fine planting job! Lovely flower. 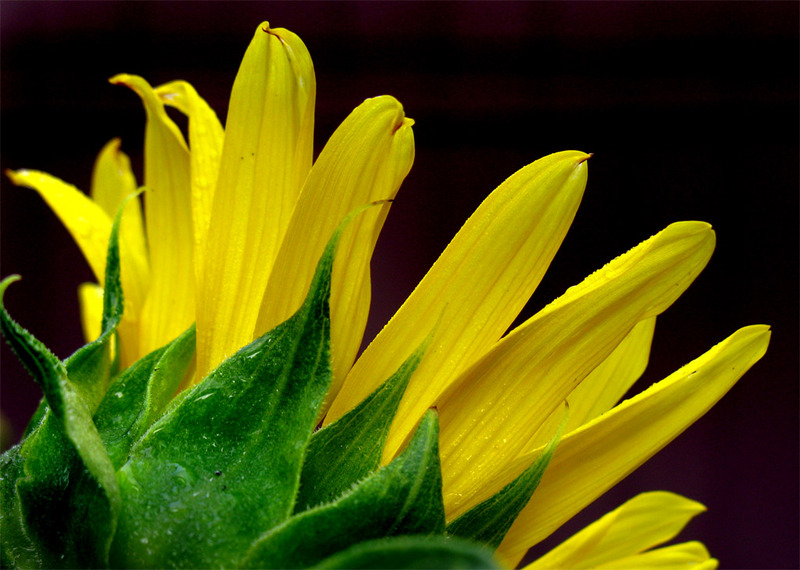 Gorgeous sunflower. I threw some seeds in our garden but they didn't come up (or they did and I didn't notice before something ate them). Your dining room table looks like mine does sometimes – though we do not have a telescope it often has other instruments of astronomy on it.